For a bride on her wedding day, she is already glowing. All the months of planning have come to fruition and by the end of the day she will soon be married to the love of her life. As a makeup artist, I want to make sure that on the wedding day I enhance that bridal glow. I take into account how the bride imagines her makeup to be and bring it all together to create a beautiful radiant look! 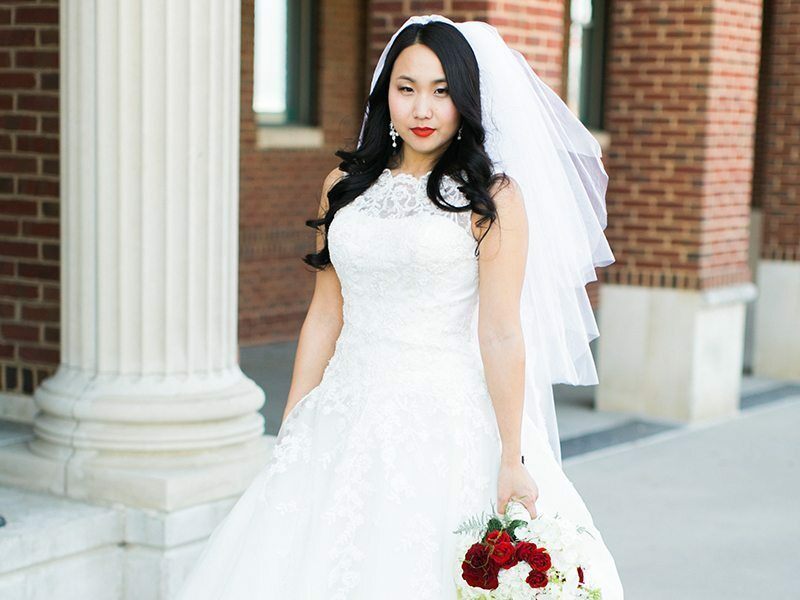 For Stephanie, it was a bit of old Hollywood glam! To achieve the super glowing radiant look I layered a few, okay several products. 1.) I used NYX HD Primer under the makeup. I have come to swear by this product. It is affordable (always a bonus), helps fill in lines and pores and brightens the entire makeup. Plus it looks so good on camera! 2.) For foundation I used Make Up For Ever’s HD Foundation. 4.) Then for even more glow I used E.L.F’s Shimmering Facial Whip. It comes in a variety of colors, all of which are wonderful, also extremely affordable. Pick it up on a brush and tap it onto your cheeks. It gives off a great colored and shimmering flush. 5.) Then I powdered over all of this to set it. Yes, powdering takes away some of the shimmer but it also helps to make the shimmer look like a natural glow. 6.) After powdering, it was the hard to get Anastasia Beverly Hills contour kit! I used this to help highlight and contour to bring out Stephanie’s cheek bones. 8.) and topped off with a swipe of Swaaag!! powder from the Beauty Beats by Essence collection, again very affordable. I know it sounds like a lot but seriously how simply beautiful did she look? 1.) Number 13 Aqua Shadow from Make Up For Ever as a primer. Apply with a brush across the whole lid. Make sure to work quick as the Aqua Shadows dry fast. 2.) Then I used shadows from the Lorac Pro Palette for a simple, soft, neutral contoured eye. 3.) Stephanie opted to use stila Stay All Day Waterproof Liquid Eyeliner so her cat eye would last through the night. 1.) Nothing says Old Hollywood Glam like a classic red lip. 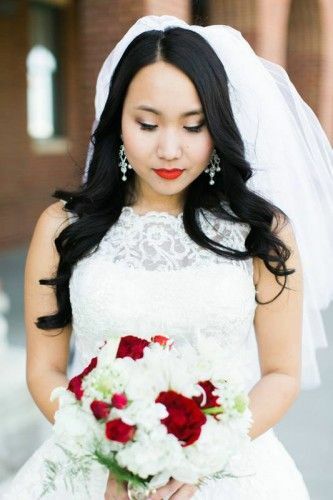 Stephanie, who was used to wearing red lipstick in theater and choir growing up, knew that she wanted to brave the red for her big day. I recommended Make Up For Ever Aqua Rouge in 8 Iconic Red for a long-lasting lipcolor that wouldn’t transfer to her groom or champagne flute! Even if you aren’t getting married, having a glowing look at any time is fun too! And several of the products I used were under $15! It doesn’t get much better than beauty on a budget! Makeup has been a lifelong passion for Lorann Schindler. When Lorann turned eleven she began working with her local high school’s theatre department doing hair and makeup. Having always known she wanted makeup to be a part of her life she continued working with it on through college. Lorann received a BFA in Fine Arts from Tarleton State University. Having a background in art she feels gives her a leg up in the world of makeup artistry. She is highly trained in color mixing, design principles, understanding how a composition should look and more. Upon her college graduation, she attended the Makeup Training Academy to hone in on her craft even more. Lorann has now been freelancing full time since 2011. She has worked on many photo shoots, runway shows, brides and TV and movie sets. She also just came off a year of working at KTXD-TV as a makeup artist for Texas Living/D Living, The Texas Daily and D: The Broadcast. Follow Lorann on Instagram, Twitter, and Facebook. Previous Review: Urban Decay Revolution Lipstick in "Shame"